Check out what we are up to! Find news, promotions, and other information pertaining to our diverse lineup of innovative brands as well as newsworthy headlines about our company and culture. Get ready to taste the new Blood Oath® Pact No. 5 Kentucky Straight Bourbon finished in Caribbean rum casks! Pact No. 5 will be hitting the shelves starting in April, and this one is not to be missed. 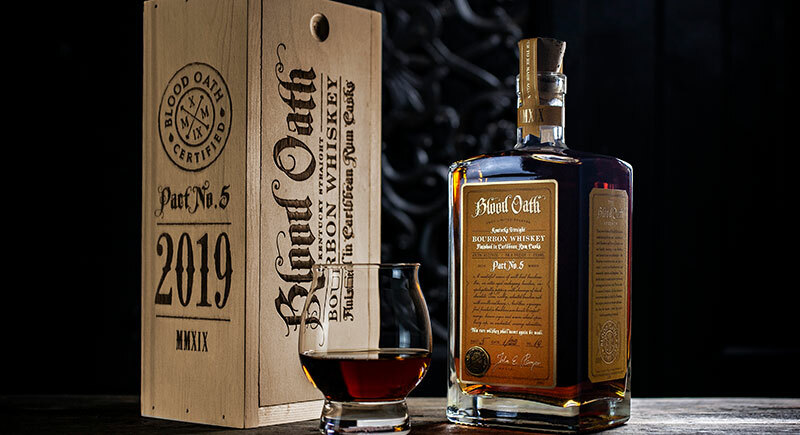 Blood Oath creator, John Rempe, began with an eight-year-old ‘ryed’ bourbon which he rested in used dark Caribbean rum barrels for six months for a touch of warm island spice. Once this bourbon picked up some of the rum notes, he combined it with an 11-year-old silky ‘wheated’ bourbon and an extra-aged, peppery 13-year old ‘ryed’ bourbon. The result? A well-balanced, spicy, sweet, lingering bourbon sure to delight the senses. On the nose, Pact No. 5 comes right off with dark fruit notes, brown sugar and a touch of orange zest, followed by a sip where sugar cane notes, dark chocolate and a little heat from the ‘ryed’ bourbon take over the senses. The sweet and spicy, lingering finish is accented by notes of honey. Once again, this rare find will be bottled at 98.6 proof and available globally but in allocated, limited quantities – only about 15,000 cases, packaged in a commemorative fire-branded wooden display box. This rare bourbon will never be made again!